Blog from Tongariro National Park, New Zealand | Margaret in Wonderlands.. The next day we headed to the Tongariro National Park and we stayed at the alpine Ski Lodge. On the way we stopped in a little town which had a massive selection of pies so I tried a mince and curry one which was really tasty. The weather was so bad so the crossing was actually cancelled. Ok let me explain a bit about the Tongariro crossing seeing as I keep moaning how I cannot do it. 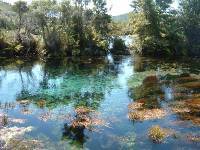 Its based in the Tongariro National Park which is a World Heritage area. It was the second national park to be announced behind Yellowstone in the states. There are 3 volcanic peaks, Mount Doom aka Ngauruhoe (where Peter Jackson filmed part of Lord of the Rings)Ruapehu and Tongariro. Ruapehu is the most active and last erupted in 1996 but it was ash and no lava. The walk is a 19.5km hike and it takes 6-7 hours and crosses the National Parks scenically amazing volcanic plateau complete with steaming craters. It is voted one of NZ's best day walks and I have seen pictures and boy it looks stunning. I have seen pictures of mountains with red on it and beautiful small ponds on the top of these mountains. It truly looks spectacular so to say I am guttered is an understatement. It would have been amazing and a good challenge for me but hey this is life and you cannot do everything. My main focus is willing my foot to heal in time for the Inca trail. We spent the very wet rainy day chilling in the lovely lodge with games, books and a spa pool. I shared a pasta dinner with my lovely America pals Katie and David who I got to know quite well and they both made me laugh so much. We had a few drinks for Bens last night. I haven't probably mentioned Ben yet but he is part of our little family and he actually lives in Harrow Weald. We found this out 4 days into the trip. He also is best friends with Adam Conway from Laddies and also his birthday is the 12th April so we have a lot in common, small small world! He heads home on Saturday and the rest of us would be in Wellington the next night but we would then all be going different ways and I was going to miss them all so much, they were a cool little family.